Readers may say, “Well, you don’t like many films,” and they’d be right. I thought Prometheus was a catastrophe, Argo overrated, Anna Karenina risible, The Deep Blue Sea regrettable. “You didn’t even like The Master.” No, I didn’t, and I may be a mean-minded Grinch; or, maybe there just aren’t so many good films. But I suggested you see The Loneliest Planet, Lincoln, Dream of a Life, and Oslo, August 31st—not that I think any of those are great. But now at the end of the year comes a masterpiece, not just the best of the year, but one of the best ever: Michael Haneke’s Amour. I should add that the film is released in this country by Sony Classics, and one of the heads of that company is a good friend. I cannot help that, and I believe I have been honest with him. I think, among his other films, Rust and Bone is the object of too much respect, his documentary West of Memphis is a rather arty mess made from a compelling subject. As for To Rome with Love, another step in Woody’s Allen ongoing life as a tourist, and a Sony picture, nothing useful or kind can be said. 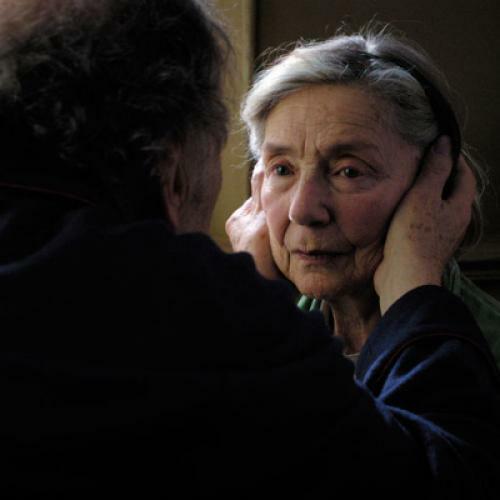 Amour, which opens December 19, is so simple in form that its great depth of feeling is easily measured. Amid the fatuous extravaganzas that are Life of Pi and Cloud Atlas, here is a picture made in one apartment with a handful of players. It runs two hours and it cost a little over 7 million euros. Georges and Anne are in their early eighties. They are retired music teachers. Anne has a brief episode of oblivion and then a stroke. The poise and stability of their life together is over; there are now two lives. There is nothing more to say, except that they do not win the lottery or chase each other through the streets of Paris in sleek Lamborghinis. Nor is there a miracle cure. In your eighties, you have no trust in cures. It is a film about these two people. But they have a daughter who comes to see them, and the daughter is a subtle gift to the film. She lets us see Georges and Anne as people we have known before. Jean-Louis Trintignant has never played a music teacher (to the best of my recollection), but he was the person who had My Night with Maud (1969). He was A Man with a Woman (1966). He has made well over a hundred films, and in one of them, The Conformist (1970), he was Clerici, hunched, hatted, scuttling, his hands thrust in the pockets of his dark coat. He had made a great film already. Emmanuelle Riva has made less than 80 films (she has also worked on stage). She was in Leon Morin, Pretre (1961) and Therese Desqueyroux (1962). She had made a great film, too: she is the French actress who wants to know about Hiroshima Mon Amour (1959). But neither of them has worked very much lately on screen, so it helps to see them through a daughter’s eyes, and to realize we have known them most of our lives, while understanding that they are altered and leaving. So two players recollected from our past are suddenly older, and that transition cannot help but serve as our mirror, too. This is something the daughter sees, and that in turn helps us feel the nature of growing older. This daughter is played by Isabelle Huppert, who will be 60 next year, no matter that we can still see her pale glory in Heaven’s Gate or Violette Noziere. There are so many films and stories about love being thwarted: that agony goes from Romeo and Juliet to Brief Encounter. But love lived out until the last days is less common. “Isn’t life hard enough?” you have every reason to ask. So why blame us if we enjoy watching kids have silly fun? But kids’ taste is catered to, amply so. I won’t tell you what happens in Amour, but you have guessed already and you can make up your minds about whether you want to put yourself to the test. You might even say, isn’t this a Michael Haneke film? Didn’t he make The Piano Teacher, Funny Games and The White Ribbon? Isn’t he a rather chilly fellow? Well, the credits are correct. The Piano Teacher (where Huppert plays a woman in love with Schubert but trapped in her own sado-masochistic mind) is not an easy film to watch. I will admit that while I admired The White Ribbon enormously, I felt that its implication—that all this emotional repression had fed Nazism—was as glib as it was rendered in cinematic perfection. I would understand your reticence to watch a pained story about what has occurred with your parents and may await you. Yet something has happened with Michael Haneke, something that spares him his own brilliance. The death of his own mother freed him to make this film (Haneke is himself 70), and the apartment he has made for it is a replica of the place where his parents lived. That is not a signal for sentimentality, much less coziness. Amour is as hard and bright as bone. The love it observes is intense, selfish, and nearly insane (these are the film’s greatest truths). It is a pact that excludes the daughter; it is far from being simply kind, or warm or feel-good. Nor is there any need to require that all films be like Amour, or so insistent on truths so impassive and inescapable they do not really need the name “truth.” But do not go so far as to forgive the silly films for not being as passionate as Amour. I daresay Haneke’s film will win best foreign picture. (It is submitted as the Austrian entry, because that is Haneke’s nationality.) But that coy reward shames us. I voiced the same feelings last year with the Iranian film A Separation. This year, I admire Lincoln. I am sure Les Miserables will entertain millions. I think Zero Dark Thirty is startlingly simple-minded—it would have warmed John Wayne (and Jessica Chastain does a version of the Duke). But it is too late to speak of “foreign” films when Amour is plainly the most demanding and complete attempt at a film this year. In the same spirit, Haneke is the best director, and Trintignant and Riva should know they have each been in two great films: The Conformist, Hiroshima Mon Amour, and Amour itself.